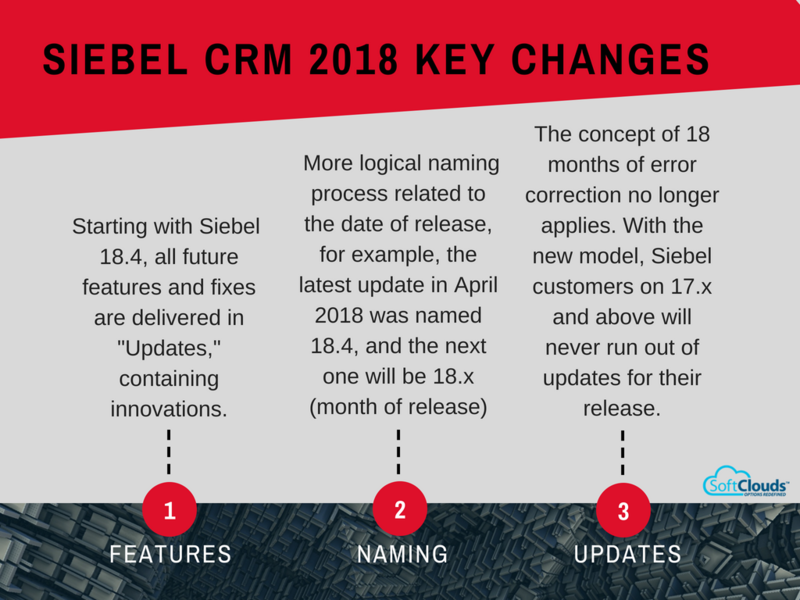 In 2018, Siebel CRM will provide a more streamlined application update process. 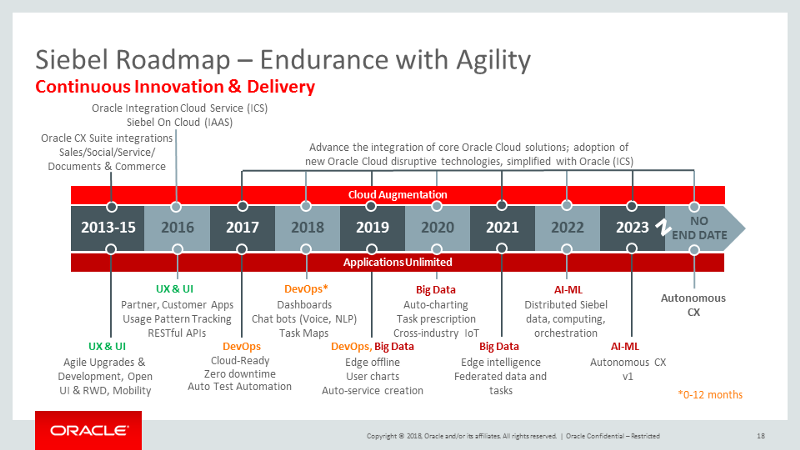 As we wrote in our blog Key Takeaways from the 2018 Siebel CRM Grand Tour, Oracle introduced the Continuous Delivery Model for Siebel where all future features will continue to be delivered in Updates. The new 2018 Siebel CRM continuous delivery model allows new features and innovations to be delivered more frequently, and it provides greater deployment flexibility regarding requirements for running incremental repository merge (IRM). Siebel customers can now embrace constant innovation updates without the need for significant upgrades. Siebel is getting more visual in 2018. The latest features in Siebel 2018 are designed to address the latest customer expectations. Here are some of the highlights. Prebuilt visualization components that allow users to quickly consume information at a glance, timelines for chronological interactions, various charts to slice and dice the data to your preference, and many more. A new Siebel Object Manager data-aggregation engine to generate optimized database queries to handle large volumes of data and provide optimal performance. A visual IDE to compose the dashboard layout, drag-and-drop capability, and most importantly compose new visual components with minimal effort. 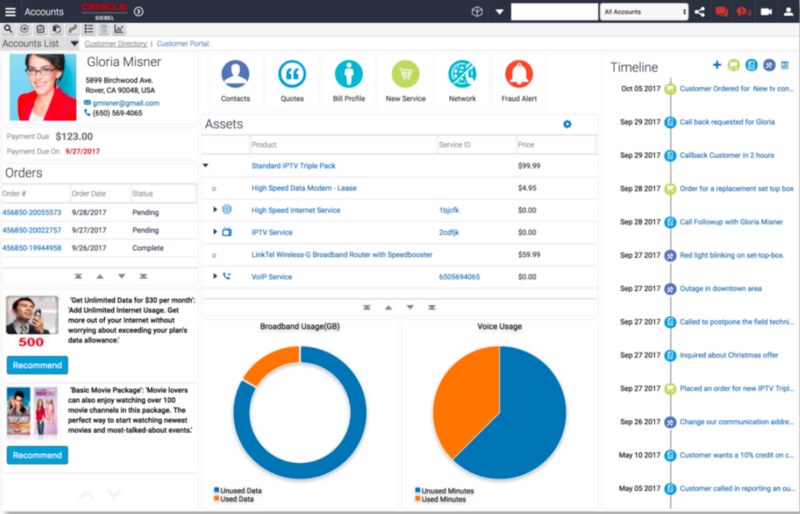 Preview dashboards by selecting different applications of choice whether it is an employee application, partner application, or customer self-service application. The ability to leverage the same visualization controls across various devices, browsers, and form factors. In 2018, Siebel customers will get more tools that will allow them to create new modern dashboards that will cater to various user roles, channels, or organizations, tailored to accommodate the ever-increasing customer expectations. The new release includes integration with Elastic Search embedded within Siebel (so a third-party REST adapter is not required for Elastic integration). Siebel CRM 2018 will provide a utility to help previous Oracle Secure Enterprise Search customers with the migration of their OSES configuration to Elastic. Faceted search capabilities for Elastic and third-party search engines to help filter search results by various field values. Support for searching attachment content for Elastic and third-party search engines. Auto-complete supported out of the box with the embedded Elastic implementation. Support for searching iHelp records and drilling down to the proper view based on the iHelp configuration. More in depth control of fields that can be displayed in the search results header and detail sections. Automatic navigation to a record when a single result is found. To conclude, Oracle is not looking to stop innovating and developing in Siebel. 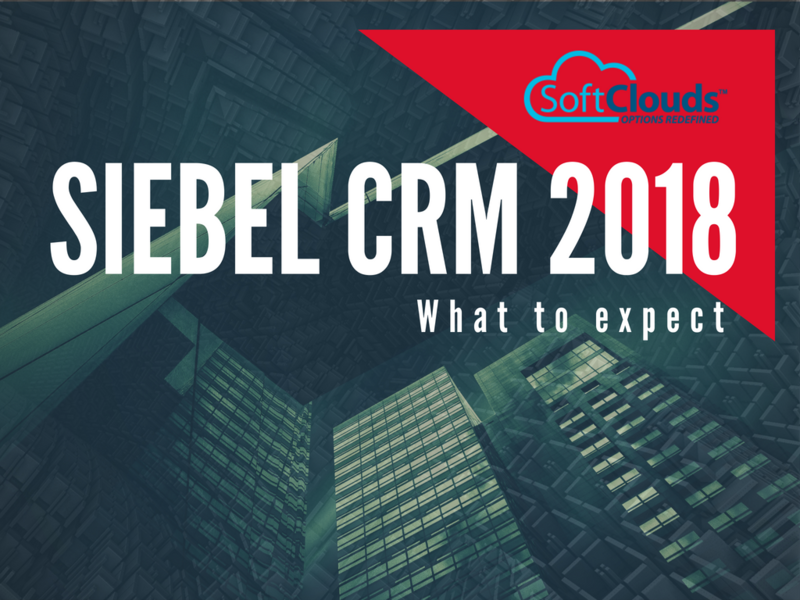 Based on our interactions with the Siebel CRM team at Oracle and according to the Siebel CRM Statement of Direction, Siebel CRM continues to thrive with a stable future and long-term innovation roadmap. In 2018, Siebel CRM is not dead; instead, it's having an agile revolution. Join Oracle in the next Siebel CRM Grand Tour event in Prague. 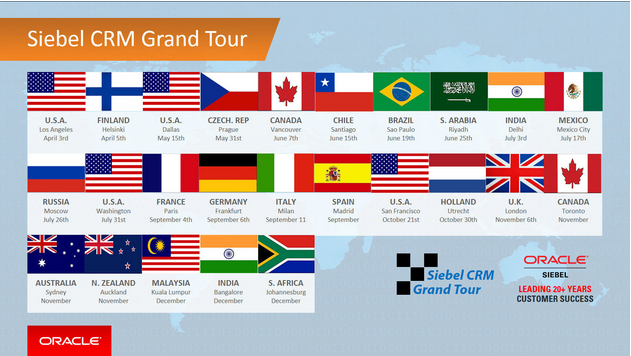 For more details about the Siebel Grand Tour see here. Registration of open events is available on Oracle.com by clicking here. This post was written by Sundar Viswanathan — Senior CRM Application Lead and CRM Practice Director at SoftClouds has 17+ years of experience with technical solution design and end to end implementations. Sundar is also certified on Oracle CX Applications and Siebel. He specializes in developing CX processes, including Marketing automation, salesforce automation and partner management and loyalty management modules.